WELCOME TO BEAD GLASS and ART GLASS SUPPLIES! 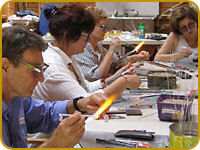 Bead Glass is 100 per cent Australian owned and operated business and has served the lampwork community since 2002. Shop here and SAVE! We are the AUSTRALIAN DISTRIBUTORS FOR CIM GLASS, EFFETRE /MORETTI REICHENBACH and DOUBLE HELIX GLASS , LAMPWORK TOOLS, ACE GLASSES, NORTEL & BETHLEHEM TORCHES and OXYGEN CONCENTRATORS. NO FEE for CREDIT CARDS, PAYPAL, DIRECT DEBIT or PACKAGING and HANDLING. OUR SHIPPING RATES ARE CHEAPER TOO. Beadglass provides regular classes for both Beginner and Intermediate levels . THE NEW BEADGLASS DIARY, STAY UP TO DATE HERE! APRIL: CHECK OUT the fresh new Effetre colours listed under 'Premiums' just arrived!....add a new pallet to your existing favorite glass combinations and recipes. We are excited to announce the arrival of our new glass shipment from EFFETRE. During March and April we are offering a Special discount of less 10% on all orders placed for Effetre Glass over $100. Super clears exempt from the sale. Metallic Black T065, back in stock....see listed under PREMIUMS. Back in stock Stainless Hot Head Hoses, listed under Torches and Kits, at the bottom of the page. CIM LAMPWORK GLASS BRAND NEW COLOUR RELEASE........Browse our huge 2019 range of the new CIM GLASS color palette , just released. Available now at Beadglass. The stars of the show are ......Baked Alaska.. Lemonade.. Egg White.. Weeping Willow.. Aiko.. Bayou.. Eden.. Wheatgrass..Mantis..Eclectus Parrot .. Ectoplasm .. Budgerigar .. continues..... Anole ..Elixir..Elixir Sparkle . Peppermint Cream.. Troi Ltd Run ..Cerulean.. Cerulean Sparkle ..Little Boy Blue ..Wisteria .. Amethyst.. Your Majesty..Tahitian Pearl.. Porpoise..2019... As the distributor of CIM in Australia, our prices on CIM can't be beaten and in bundles of 115gm / � lb ! NEW ZEALAND :DAILY EXPRESS DELIVERY FROM AUSTRALIA ... followers, kindly note that we ship EXPRESS, if requested, with no limit on weight, including GLASS, TORCHES, EQUIPMENT and TOOLS. We always aim to carry the latest and best Lampwork Products and Glass available to the Australian and New Zealand Lampwork Community, and to that end have increased our products three fold in the last year, and as always, interested to hear your requests and comments. REICHENBACH 104 : SEE EVERY COLOUR IN THE RANGE.. NOW AVAILABLE HERE IN AUSTRALIA ! bringing down prices on Reichenbach with continuous supplies. We pass the savings on... and YOU save on our reduced freight prices from Germany! The Reichenbach colours can been viewed under 'Reichenbach' in both Transparents and Opaques. There was a nice trolly load of new stock unpacked recently including NEW LUMERE LUSTERS COLOURS, all listed under 'LUMIERE' in the shopping cart. WE HAVE ADDED IN SOME INCREDIBLY BEAUTIFUL BRAND NEW COLOURS , AS WELL AS A TOP UP OF ALL THE OLD FAVOURITES. NOW 28 BEAUTIFUL COLOURS IN TOTAL! BETHLEHEM TORCHES : NOW, ALL LISTED. WE HAVE ADDED TO OUR INVENTORY OF BETHLEHEM TORCHES. ALL THE LATEST MODELS ARE HERE AND ARE NOW LISTED . .SEE THE NEW STACKS, THE SHARP FLAME HAND TORCH ,ALPHAS, BRAVOS AND CHAMPIONS....ALL IN STOCK. Ribbon Mandrels in sizes :8mm x 2mm,12 x 2mm ,16mm x 2mm...see descriptions under 'MANRELS ALL' ON SALE. How to Use PUFFY MANDRELS.....A free 'How To', tutorial is also included on the 'MANDRELS PAGE' , listed under 'MANDRELS ALL' in the Online Shop....then explore further with the beautiful, intensely coloured THOMPSON ENAMELS range...also included is a free tutorial, listed under 'THOMPSON ENAMELS'. PAYMENT PLANS ON TORCHES AVAILABLE: CHOOSE THE TORCH YOU ALWAYS WANTED NOW! Bethlehem and Nortel Torches are now available on a payment plan, interest free ! By taking the pain out of a once up payment you can pay in smaller increments to suit your budget. The Torch is shipped to you, once the payments are completed. All in stock now. Contact us for your requests. Lots of Emiko Mandrels, popular sizes 4.76mm, 18mm, and 19mm. Ideal for making large hole discs and beads. See listed under 'Equipment' page. NEW GAFFER POWDERS : listed under 'Gaffer Powders'. These 10 new, stunning and vibrant powders present a whole new palette of colour for glass as well as metals, in addition to the Thompson Enamel Powders also available at Beadglass. LINING WIDER BEADS KNOW HOW: If you enjoy making wide beads then the essential, Wide Impress Beadliner is an important addition for the creative bead artist . The NEW WIDE IMPRESS Beadliner works just like the original Impress on "normal" size beads, but has the extra advantage of working on MUCH WIDER ITEMS as well, eg silver pendants, huge beads, fused or slumped glass pieces. These are listed under Beadling tools. OUR PAST INTERNATIONAL TUTORS WHO HAVE TAUGHT FOR US HERE IN AUSTRALIA INCLUDE HOLLY COOPER, ANDREA GUARINO and JIM SMIRCICH.